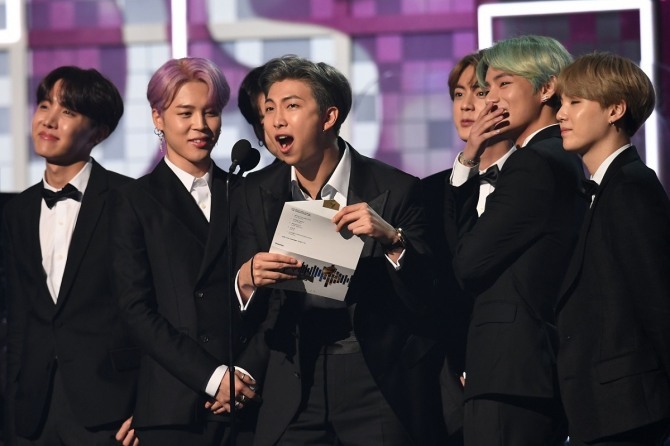 BTS appeared at the Grammy Awards for the first time as award presenters and a nominee band on Sunday (Los Angeles time), a distinction no other K-pop band had achieved. The seven bandmates of BTS -- Jin, Suga, J-Hope, RM, Jimin, V and Jungkook -- marched to the stage of music’s biggest night as their song “Fake Love” played. They delivered the best R&B Album of the Year to H.E.R., whom BTS named as one of the artists they were excited to meet at the Grammys. Following the short speech, RM announced H.E.R. as the winner for her self-titled EP, with V handing the trophy to the 21-year-old American singer. Earlier in the show, BTS could be spotted singing along to H.E.R.’s performance on stage. Despite much anticipation, BTS left empty-handed on the awards front. The group was nominated for its first Grammy for best recording package for 2018’s “Love Yourself: Tear.” But, the album artwork designed by Lee Do-hee of HuskyFox lost to St. Vincent’s “Masseduction,” created by art director Willo Perron. While they did not take home a trophy, BTS caused a social media storm before and during the show, becoming the first Korean artists to ever appear onstage at the Grammy Awards. The hashtag #TearItUpBTS was trending worldwide on Twitter. On BTS’ golden night, the bandmates opted for classic black tuxedos by Korean designer Kim Seo-ryong for J-Hope and JayBaek Couture for the rest of the group. At the 2019 Grammy Awards held at the Staples Center in Los Angeles, Alicia Keys, a 15-time Grammy award winner, hosted the ceremony, sharing a special opening stage with former first lady Michelle Obama, Lady Gaga, Jennifer Lopez and Jada Pinkett Smith. The night’s top honor, Album of the Year, went to country singer Kacey Musgraves for her “Golden Hour,” which bagged four Grammys total. The Grammys’ other two major awards, Song of the Year and Record of the Year went to Childish Gambino’s “This is America,” which became the first rap-based song to win two coveted awards. Dua Lipa won Best New Artist, while Cardi B won for best rap album with “Invasion of Privacy.” Lady Gaga added three awards on the night, including two for her hit song from “A Star Is Born,” “Shallow.” Brandi Carlile also took home three awards.